Discussion in 'd.i.y.' started by tiggers, Feb 8, 2019. I am keen to try some SBLs in my system in place of Allaes, but I am a complete perfectionist when it comes to aesthetics. 99% of the SBLs on sale are not aesthetically good enough for me and the only pair I saw that I liked I stupidly forgot the auction end date (on eBay) and lost out despite already having made a sizeable bid. Now I am pretty good with my hands and have access to a cabinet sprayer (he's a friend) who can spray the cabinets any colour I want if I do the prep. I am tempted to buy a tatty Mk2 set and strip them down, paint them and rebuild them... I know about torquing the drivers and the making new mounts for the top box, gasket seals etc. None of that worries me and I would buy some replacement foams as well. My question is do any of you knowledgeable people know if there is anything I don't know that I should. Is stripping them down relatively simple etc.? Any help would be appreciated. Many thanks in advance. It depends on how much you need to strip down and how you go about it. The bottom box woodwork isn't at all easily separable from the integral tubular steel stand so if your intentions go as far as re-powder coating the steel you're in for a bit of bother. Also most units don't have wood veneering on the unseen (or in terms of the horizontal edges of the bottom box mostly unseen) surfaces so if you're going for perfection it's best to seek out one of the very latest pairs with hornslett built cabinets which are a touch better finished. I wouldn't personally go for tatty and unloved since they are quite prone to bass driver damage as well as cabinet damage and bass drivers are now very expensive to obtain. I've twice been caught out with used SBLs and damaged bass drivers! OTOH you could wang your Allae drivers in since they're the same, as in fact are the crossovers. Perhaps somebody will sell a pair of tatty cabs as spares. It cant be long before SBL's start being broken for spares since dead ones are often beyond economic repair these days. My wife hates the look of them but puts up with it because they sound so good. Thanks for the reply. How is the bottom box attached to the steel stand then? Is it bonded? Good point re. the bass drivers, but when I say tatty I mean tatty to me.... I won't go for a complete mess. Yes, it's the ugliness thing that's part of why I want to try and make them blend in a little. Here is an example of what can be done if you are "pretty good with my hands"; and if you have a friend that can spray the result will be even better. I thought the mk 2’s bass driver had a lip around the outside of the flange? Yes definitely a later Hornslett pair since the veneer is clearly on the top surface of the bottom box. With decent pics and correct description they would fetch around a grand. The mk1 had The pressed chassis and lip, made by Mordant Short, the mk2 has the flat suround. Made in house ? It’s an odd advert, clearly there with SL2’s you’d have thought there was enough knowledge to know the differences ? Cheers all, I saw those but the ad says they are mk 1s. I admit I’m not well versed enough with sbls to know the identifying features between the 1s and the 2s. Can anyone give an idea based on serial numbers of when the mk2s started? Mine are mk2 and I thought they had the lip. On checking they’ve not got the lip. Doh! Unfortunately there isn't 100% clarity on that issue and actually there are four basic versions out there rather than two plus one fairly common hybrid. They had no internal veneering on the cabinets. The next incarnation introduced internal veneering to the cabinet after a manufacturing error showed that it improved the sound. That change was made before 1993 (86XXX) but not sure when. Both earlier models are often updated to take the MK2 bass drivers and then look indistinguishable from ones made as MK2's , but the earliest one doesn't sound quite as good if you do that, though not by very much. The later ones genuinely are full MK2 spec if updated. Then the driver changed and the MK2 name was adopted in 1995. Then in 1998/99 ish he cab manufacturer was changed to Hornslett and that apparently also improves the sound slightly and definitely improves the build quality of the cabs! The ones above are not Hornslett cabs since the darkened bare mdf appears in the gap between mid and bottom cab. First Naim Built driver in SBL - (start of DEC B1/4495 - never understood this) S/N 115596. First SBL build using bass unit with RDM cone - (NOV B5/4896) S/N 127682 - this is a move which I haven't ever remarked before. One might imagine an improvement though. For me there’s 3 versions, the original with the ms woofer, not veneered all round. 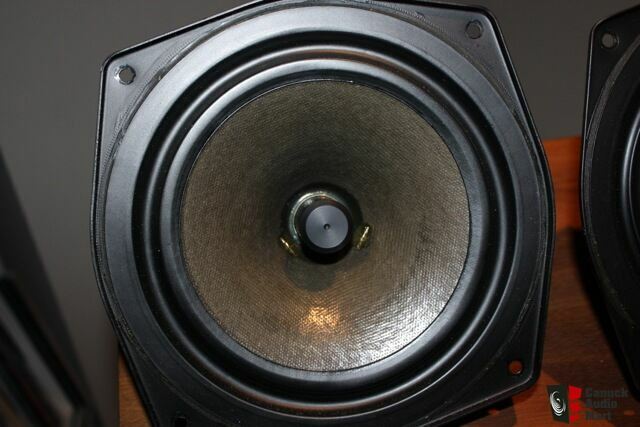 2nd version with mk 2 woofer, they were either made like this or upgraded by factory/dealers and the final version with the same drivers but veneered all round. I’ve had 2 pairs at the same time with each woofer. The mk 2 is better, but with all things getting old if a minty pair of mk1 came up don’t discount them, buy on condition, the differences aren’t big. Been in touch with the ebayer with the SBLs mentioned above, no serial numbers as they were originally bought by a manager at Naim.... while that may be true I see lots of non serial numbered Naim products and do wonder as to just how many staff specials one company can supply? No idea how to verify staff build on a pair of speakers. Anything else there's a very easy way by confirmation of the absence of an internally inscribed serial No on the chassis. Did they do anything similar for speakers? No idea, but I'm leaving those... they may be a bargain or they may be something completely different. Will wait for something more concrete in the history department to come along. FWIW if you need to remove the tweeters for spraying, you are going to have a hard time. Can I ask why? Tweeter changes have been done on SBLs and I don't recall anyone saying they were that difficult.You need to separate the tweeter from the cabinet, but there are various methods of doing that without damaging either.